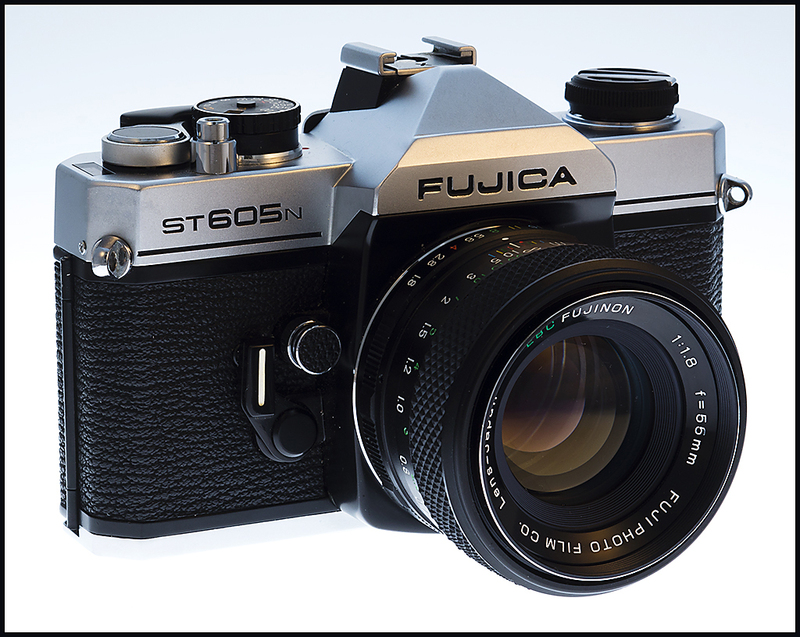 Posted: Sun Nov 18, 2018 5:49 pm Post subject: Your Favorite Fujica Camera and Why? 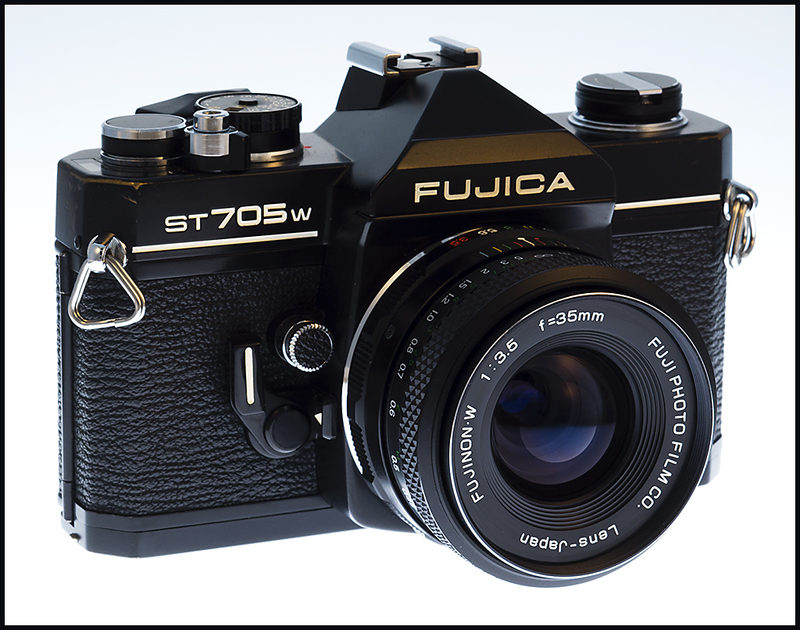 Okay, I thought I'd get the ball rolling by posting about my only Fujica camera, an STX-1n. It reminds me a lot of the Nikon FM and Pentax MX. Like both cameras, it is all mechanical with the batteries (two SR44s or equivalent) powering only the meter. The meter readout is a red LED dot next to a + or a O or a -. Like the MX, it has a horizontally traveling cloth focal plane shutter, so its flash sync is at 1/60. Unlike the FM and the MX, its shutter speeds top out at an oddball 1/700 second. I like the feel of this camera when in operation. The controls are positive and the shutter speeds sound crisp. One pushes the shutter button halfway down to activate the meter LEDs and they remain active only when the shutter button is halfway depressed. I'm assuming that the reason why there is no on-off switch for the meter is because it appears to be active only when the shutter button is halfway depressed. The STX-1n is a lightweight camera and is physically closer to the size of the Nikon rather than the compact Pentax. 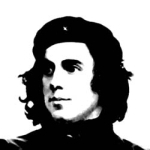 Unlike the MX and the FM, it does not have provisions for a winder or motor drive, nor does it appear to accept interchangeable focusing screens. So, in this respect, it more closely resembles cameras such as the Pentax KX or Canon FTb -- except it doesn't have mirror lock up, which both the FTb and KX have, and it isn't as large and heavy as those two old workhorses are. I found my STX-1n at the goodwill auction site, after looking for bayonet-mount Fujicas there for some time. 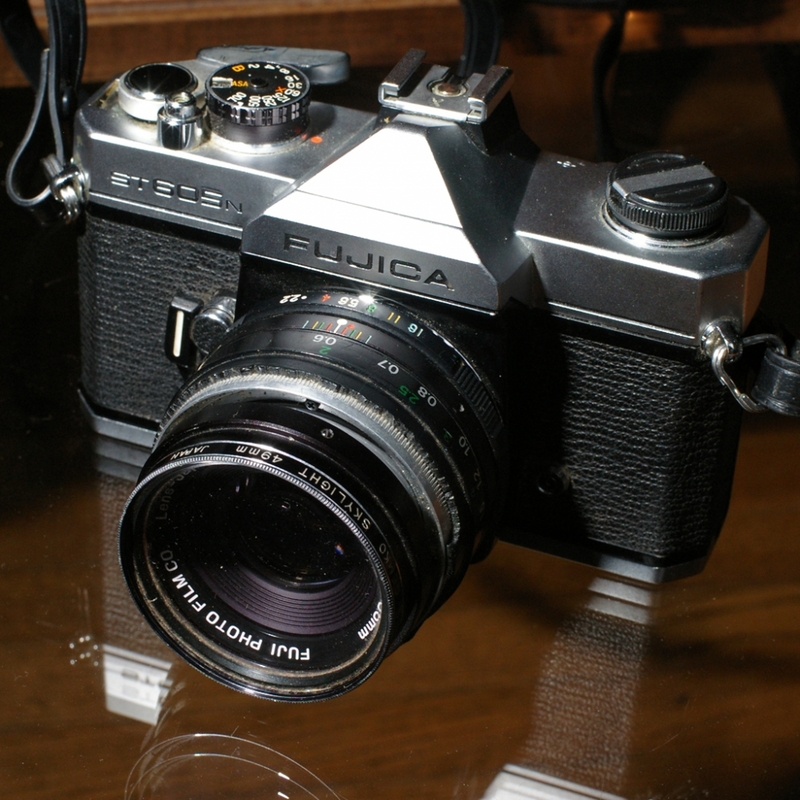 I ended up buying a lot of four cameras to get the Fujica, which came with the 50/1.9. The lot included a Canon T70 (which went into my Canon collection) a Nikon FG (that I got good money for on eBay) and a Pentax Super Program, which works fine, but has meter display issues. So, 3 out of 4 ain't bad. I think I paid about $30 for the lot. Just the money I got for the FG on eBay put me way ahead, so everything else was effectively free. The camera is in very clean cosmetic shape, but it has some globs of something visible within the viewfinder -- it isn't crud on the focusing screen, so it's probably something that's fallen between the pentaprism and the focusing screen. It also has one LED that isn't working. The LED next to the + doesn't light up. Not really a big deal because I can still easily enough determine correct exposure. Maybe I'll open up the camera one of these days and clean out the crud, and see if I can find out what's causing the top LED not to function. Currently, I'm looking at some AX-3s and AX-5s on eBay. They look like decent auto-exposure cameras. And from what kypfer told me in the concurrent Fujinon 55/2.2 thread, the AX-5 can use M42s (with appropriate adapter) in various modes, inlcuding full-aperture metering. From what I've read so far, this is a feature unique to the AX-5. The AX-5 seems to me to be very similar to the Canon A-1 in capabilities, lacking only its Depth-of-Field AE, which I never used with my A-1s. I've found some bayonet mount Fujinons on eBay, and some of them are pretty expensive. Others not so much. Fortunately, I picked up a Tamron Adaptall-2 mount for mine, so I can use my rather large collection of Tamrons with my STX-1n. So, your turn. 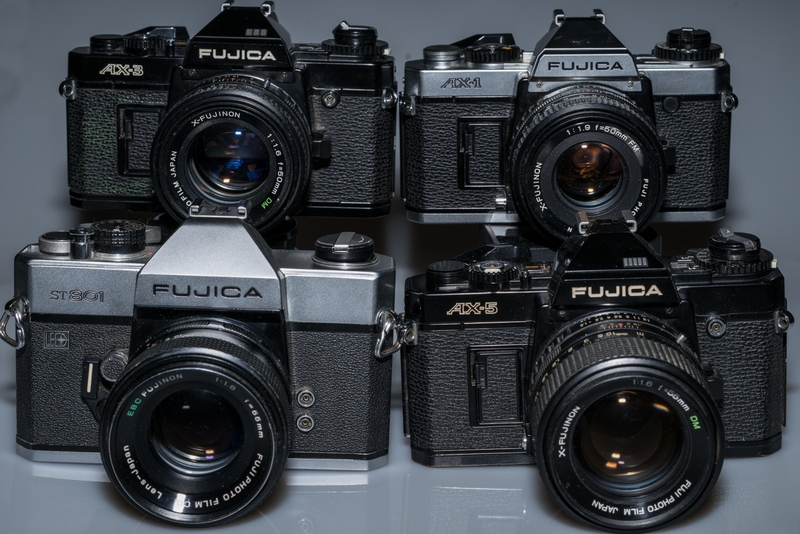 What's your favorite Fujica, and why? Got any favorite lenses? I know already that the 55mm f/2.2 is a favorite of many, and, after viewing some images taken with this lens, I can see why. 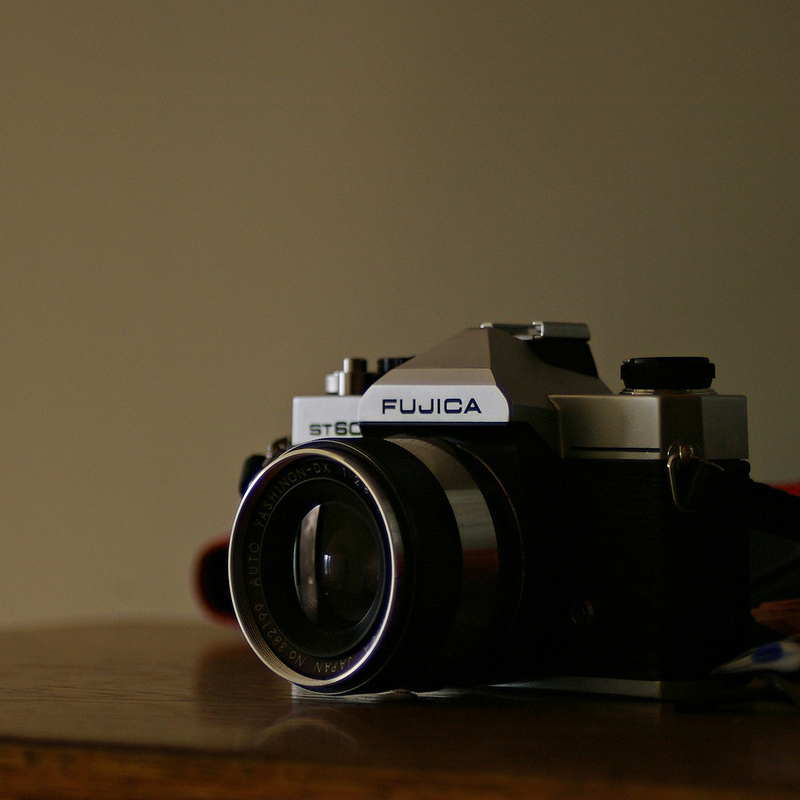 This is my favourite Fujica which I have kept for sentimental reasons. It was my first 35mm camera given to me by my dad in the mid 1970's. I have put hundreds of rolls of film through it over the years and it still works like new. A few years ago I acquired this one, mainly for the lens which is excellent. I've posted some details on your other thread that you may care to peruse before investing in any Fujica AX bodies. Well I've only got an STX-2 and can't see any features in it's favour and is just another fairly basic film camera. e.g Shutter speeds are 1000 to 1/2 secs........so why do I have it? well for the 100mm f2.8 and a few other lenses and was persuaded by the hype for Fujinon lenses by some members. Excalibur, the STX-2 seems to me to be pretty much a straight up clone of the Pentax MX -- except it's a bit larger. But to me that's just about all one needs in a camera. I wouldn't mind getting an STX-2 one day just to have the 1/1000 sec top shutter speed. About AX-mount lenses, y'all tell me if I'm wrong here -- but it seems like most of them are just kinda okay, and not as good as Fuji's M42 lenses. I'm somewhat surprised by this because Fujinons have always had such a good rep. I mean their large format and medium format lenses are top notch, so I'd just assumed that their latest 35mm lenses would be up to the same level of excellence. 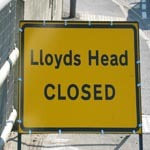 This doesn't appear to be the case, though? I don't know which I like more: ST801 or AX-5? Both have their merits. Well, finally I think the ST801 wins for the 1/2000 sec exposure time and it's (possibly) battery-free operation. IMHO also the finder is brighter in the older ST801. I've some times ago compared the M42 EBC Fujinon 55mm/F1.8 with the AX-mount DM Fujinon 55mm/F1.6 and can say that they are performing equally excellent in terms of sharness and contrast. Also the newer X-Fujinon DM 50mm/F1.6 is very good. 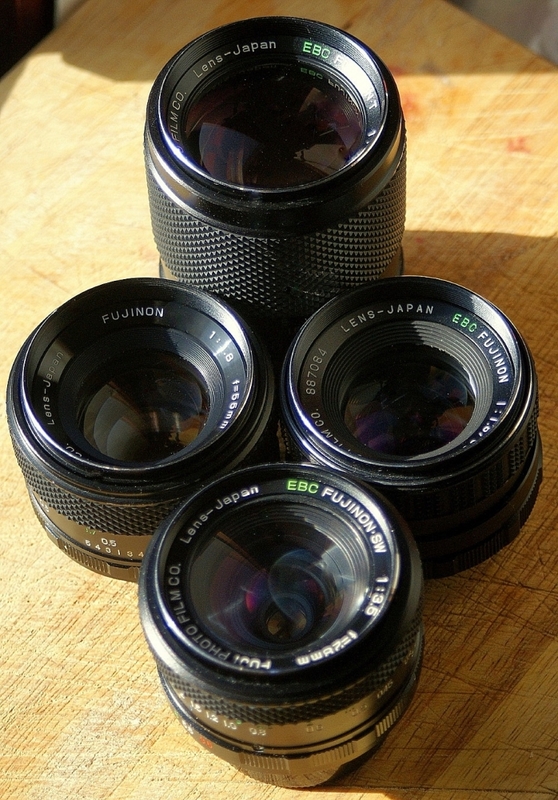 Other AX-mount lenses are a mixed bag. 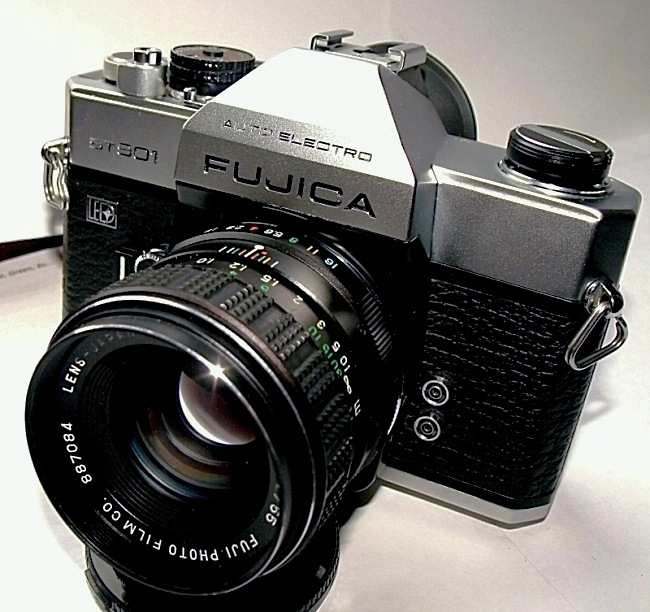 Particularly beware of "Fujinar" lenses in AX-mount. These are cheap 3rd party lenses. Edit: Just done a quick comparison between my Fujinon normal lenses on my Sony A7R II. As already stated, the older 55mm lenses (both M42 and AX) perform equally excellent; i.e. the AX 55/1.6 non-EBC is fully open as good as the slower M42 55/1.8 EBC lens fully open. The newer AX ones in 50mm can't match that; i.e. the 50mm/F1.6 is visibly below the 55mm/F1.6 version in terms of sharpness and contrast. Maybe my 50/1.6 is a lemon, I don't know. Unfortunately I don't have a second copy in order to proof that. I love the ST605/605n - the camera is one of the most beautiful 35mm SLRs in my eye, and the stop down mechanism is the best execution of it. I had a 605 that I gave away and replaced with a $3 ravaged 605n - the lens focus ring is chipped off and the rewind button on the bottom is missing... but it takes fine pictures. One of ma 5 favourite cameras ; the ST901. Still use it regularly. All ma lenses are still tabbed. Didn't want tae ruin the lenses just tae use on other cameras. I like the 135/2,5 but don't know about the IQ. 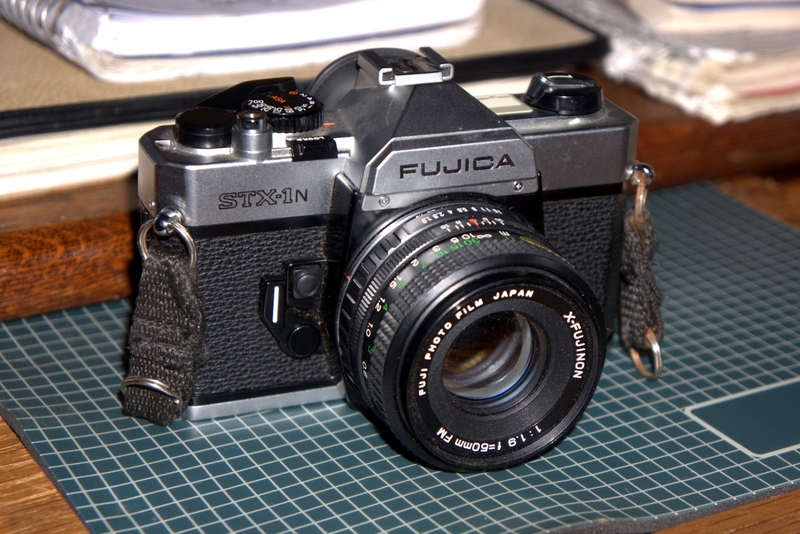 The only Fujinon I have is a really nice looking ST701 that I bought as a scrap camera for the 55 f1.8 lens. The camera needs a set of seals and mirror bumper ( easy fix ) but the meter isn't working and the needle is stuck. It's a nice camera which I paid £7 for, the lens is perfect and worth way more than that, so I'll take the top off and poke around, I might even fix it. I keep an ST705, but the only reason for that is it has better split screen than Pentaxes, and it's easier to set infinity on it.